We wrote about James Wong's new book "Homegrown Revolution" last year, and I was reminded to have another look through it recently at our bloggers day out at Great Dixter. The attendees at Great Dixter write a variety of blogs catering for a number of different tastes and styles of gardens. As you would expect a number are very keen growers of fruit and vegetables. 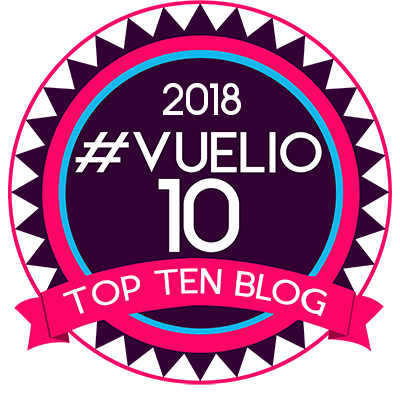 We were asked a couple of times about any interesting or unusual edible exotics that we may grow, and to be honest the numbers we do grow are fairly small. We do grow a number of figs - we even blogged about them a couple of year back (see our Fig Blog here). But to be honest we mostly grow them for the leaves and appearance rather than their fruit, which in any case we have to beat the squirrels to as they usually get there first (grrr squirrels!!). The pergola on our bottom patio (next to the old koi pond) is covered in a grape vine, however I managed to select a wine grape that has a slightly bitter taste rather than a nice eating grape. The birds normally eat the grapes, although some years we have to harvest and discard, as Mark blogged about back in 2010. So is that it, some bitter tasting grapes and figs we generously provide for the squirrels? Well basically yes. We have grown a few other veggies in the garden at one point or another, including sweetcorn, tomatoes, onions and runner beans, but nothing for a while. Which brings me back round to looking through Homegrown Revolution again, and choosing a selection of cool looking edibles, many of the vegetable seeds, although not all, in the book are available from Suttons as part of a tie in with the James Wong Homegrown Revolution book encouraging people to grow your own vegetables. If one plant jumps out the most it must be the Cucamelon, I mentioned it back in December, but have noticed it cropping up on a number of different blogs of late. It seems to have captured the imagination somewhat of multiple bloggers. I think they looks great, they even sound like they have an interesting taste, but lets face it most of us would grow these for the way the cute little melon-like fruits look as opposed to the way they taste. We are going to give these a try this year. Seeds for Cucamelon are available from Suttons. Deviating slightly from James' book, but exploring more unusual looking edibles, how about Borlotto Firetongue, which if nothing else the name should make you want to grow this. 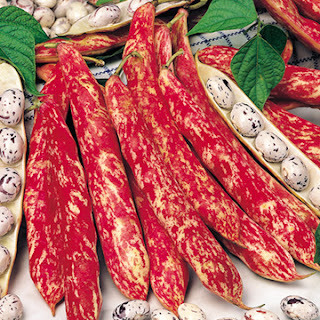 Its actually a type of French Bean, but look at those highly ornamental seedpods. These would work well in an exotic setting adding a flash of red maybe growing them up a bamboo. At this point I should probably mention I'm not actually very keen on eating French Beans, so any crop from these will have to be tested by my parents! is Callaloo, apparently it tastes like a cross between spinach and watercress and is known as Carribean spinach. It really is a riot of colour, and in some ways resembles coleus, (well it does to me anyway). It can be eaten after just six weeks from sowing. James recommends using this in salad, or in stews. Me I'd recommend it in an exotic border! It likes a well drained soil and can be sown directly into the ground from May until early August. A South East Asian native and familiar to many as vanilla grass, Pandan is widely grown in the tropics and is apparently easy to grow here although it is suggested in that its best off in a greenhouse or even kept indoors permanently. Despite that I'd still like to give this a try outside for the summer if we get a hot one. Failing that, its a windowsill plant for us. Like many of the plants featured in the book this one is also available from Suttons but only as a plant rather than seeds. 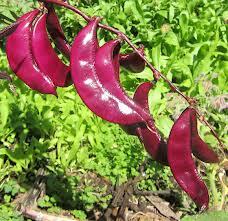 The Hyacinth Beans, Lablab purpureus are another cool looking bean. The bright pink flowers and vivid purple beans make this South East Asian crop another worth including in an ornamental and exotic setting. To get them to fruit you need a long sowing season so these really do need to be started asap, ideally before mid April. There are several named varieties of Lablab pupureus but James suggests that 'Ruby Moon' is the best. They need a lot of heat to get started so they are one for a propagator to begin with, and then only plant them out in late May once the risk of frost has gone. They can scramble up to 1.5m, so will be another interesting climber to have running through an exotic bed. They will repeat flower (and fruit) if you keep picking them so once they start it is worth harvesting the fruit regularly. Whilst I don't think we will ever have a veg plot perhaps we will grow an increasing number of edible plants in the garden, and after all who ever said growing veg prevented you from having an ornamental garden! There were a number of edible garden flowers too, dahlia and canna for instance, although i'm not sure im ready to eat them. 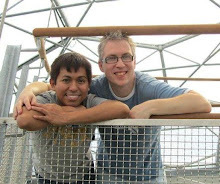 Worth checking out his blog as he regularly features the plants and the food. He did a purple carrot cheese cake recently which looked truly bizarre, but I would love to taste! I love those beans. They look a bit like hot peppers. 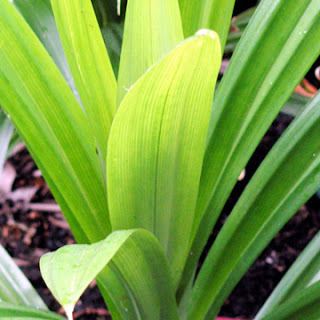 And pandan: I will definitely try to grow this. We needed it for a recipe recently and had to resort to paste in a jar. I'm growing a similar looking bean this year called Dragon's Tongue. I've grown the tricolor amaranth several times now, I never even realized it was edible. Maybe I'll actually have to try it if I grow it again this year. 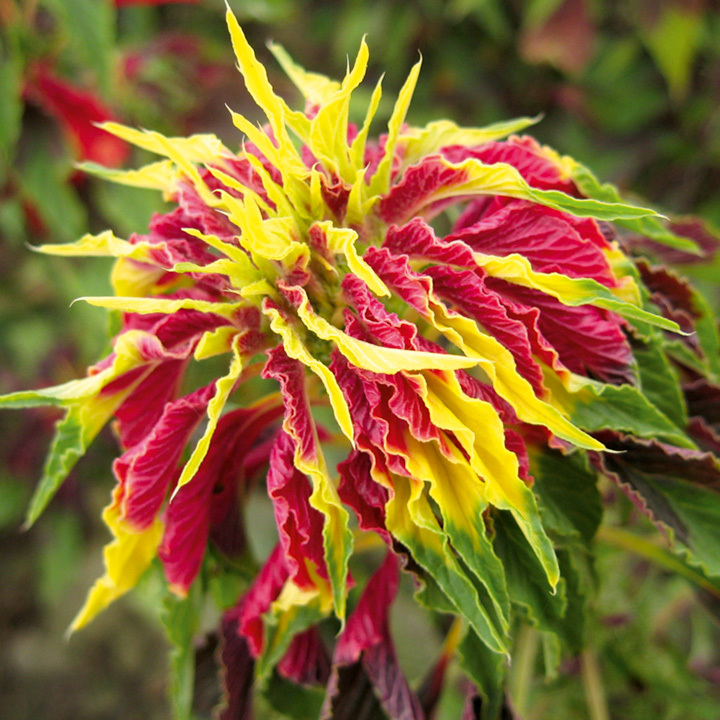 I think it's such a cool plant but apparently it's too gaudy for most of my friends :( There is a slightly more subtle (but only slightly) variety that is dark red leaves with magenta bracts called Early Splendor that is also really lovely. That sounds a nice one Tom, i'll have a look out to see if its available over here. With the exception of the hyacinth bean, these are all new to me and look really cool. I especially like the french beans and amaranthus & will look for seeds! Cucamelon seems to be the plant for this year. I am pretty sure Suttons were selling it as plants as well as seeds. I use to grow some veggies. Loved having the fresh ones but dealing with the squirrels was awful. Would love to still have the room though. The squirrels do seem good at harvesting! Very interesting veggies! I love the Firetongue. Just may have to try those. And I'd love to try hyacinth beans, too. Those cucamelons, though, just look - odd. The Firetongue seems to be something of a hit so far! Ooooooh a most timely reminder that I have some cucamelon seeds and some eucalyptus lemon bush seeds, also from the 'Homegrown Revolution' range lurking in my seed box. Must get them in soon. Have seen the hyacinth bean looking most attractive gowing up a cane wigwam in an ornamental garden. Its good to hear we are not the only ones growing the Homegrown range too! 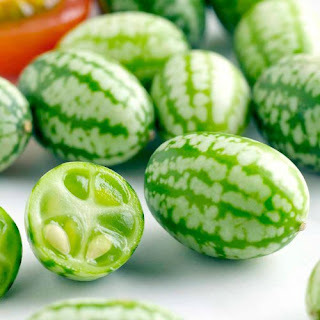 The names are pretty cool too, Cucamelon is also known as a "Mouse Melon", which is also rather cute. I've grown most of these at one time or another, so I will be interested to hear how you get on! How did they do for you Emma? That's quite an array of unusual veg...and every bit as showy as any flower. I like the idea of mixing them into ornamental borders. I love growing veg of all descriptions in my garden after having to give up my alottment. The past few years have been some what of a disaster due the lack of sun. However I am not one to give up readily. Gaz and Mark, love the idea of growing beans through the boos, I grow em up my nanas last year.